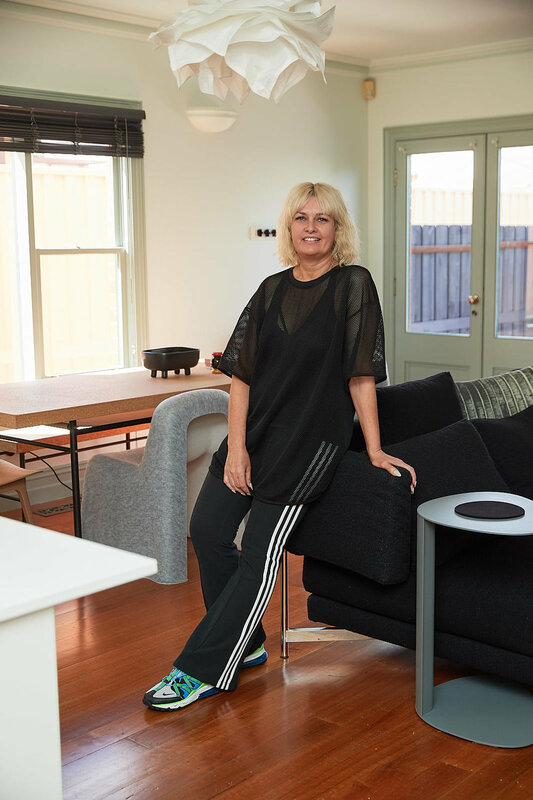 A passion for interiors prompted Tania Davis to move from her native Dunedin to Melbourne, where she works at Space Furniture. Fifteen years later, she tells style director Louise Hilsz why the buzz of Australia’s fashion capital means she’s never looked back. Where do you live and what do you love about Melbourne? I currently live in Preston but I’m about to move to Collingwood. I love that there’s always something new and exciting happening somewhere in this city. You’re a visual merchandiser at Space Furniture, what does that involve? At Space I’m responsible for the presentation, planning, ordering, stock control, and execution of all displays for our Melbourne showroom. I also collaborate with the brands we represent for internal and external events. My colleague and I share this role and have a total of 17 years’ experience between us. Checking emails and putting out fires! There is never a quiet time of year, so it’s always fast-paced and you need to be able to make decisions quickly, with imagination of course! You have to travel for work, what are your favourite destinations? There are too many to state. Mainly the opportunity I have to meet and collaborate with amazing furniture houses and their designers, who we represent. What do you love most about working in the interior design industry? Dreaming and collaborating on new ideas with the pace and energy that drives most creatives. What furniture trends are you excited by right now? How curvy 1970s Italian furniture is inspiring current designers. What interior colours do you love right now? Not any one particular colour; it is more about the emotion that colour evokes in an environment. What are your favourite interior stores in Melbourne? Melbourne has some incredible boutiques, where do you shop for 80s and 90s vintage buys? Smith Street Bazaar, Lost and Found Vintage Market, Camberwell Market, Leonard Joel Auction House, Castorina and Clavell. What are your favourite Instagram accounts for interior inspiration? What do you love about your Victorian terrace home? The large, characterful spaces and the fact it lets in the perfect amount of light. Eclectic, witty and relaxed. It’s a reflection of the years I have spent cultivating my taste and eye. What do you think makes a great interior? A space created with an open mind, which is personalised and tailored for your enjoyment. I’d have to say coats, jackets and sneakers. What is your one fashion indulgence? Who are your favourite local and international fashion designers? Locally, my favourite is Romance Was Born. Internationally, there are too many to name but definitely Vetements, Comme des Garçons, Yohji Yamamoto, Issey Miyake, Maison Margiela, Kenzo, and Zambesi. You are spoilt for choice when it comes to eating out in Melbourne, where do you send your friends when they visit? Cumulus in Flinders Lane. It’s located inside an amazing turn-of-the-century rag trade building. What's your favourite Asian restaurant? The Dojo Ramen Bar for the amazing Tan Tan Men spicy noodle soup. D.O.C for the squid ink pasta, the barramundi at Bar Carolina, and pizza at Capitano. Best Greek or Lebanese food? Téta Mona for its honest, traditional Lebanese food. Where would you eat if it was your last night in Melbourne? Tina’s Noodle Kitchen for the spicy stewed beef. The BeautyEQ team travelled to Melbourne with thanks to Visit Melbourne.